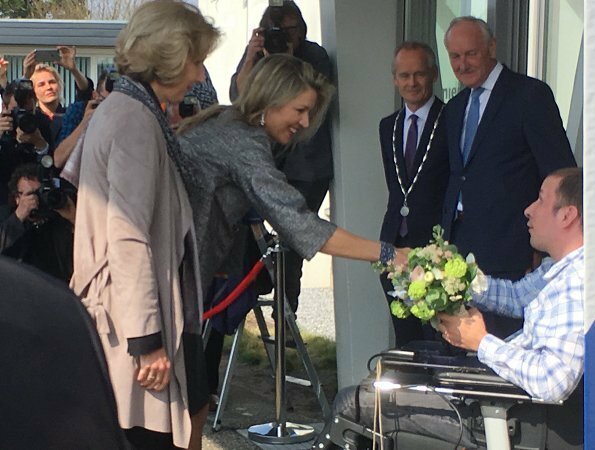 On April 11, 2018, Wednesday, Queen Máxima of The Netherlands attended a conference of MS International Federation (MSIF), held at MS expertise center of Nieuw Unicum care center in Zandvoort, The Netherlands. The Queen then made a working visit to MS expertise center. 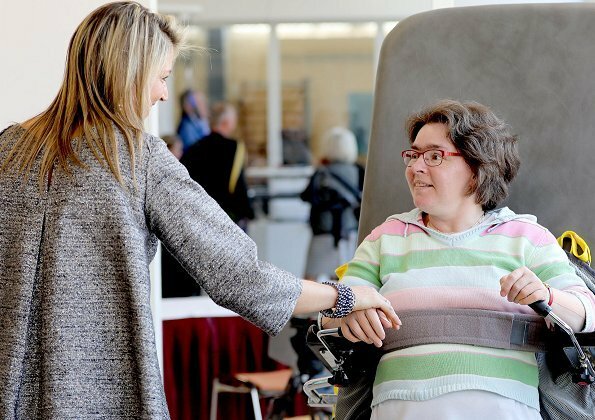 The MS Expertise Center is a multidisciplinary treatment center where MS patients reside, are taken care of and treated. 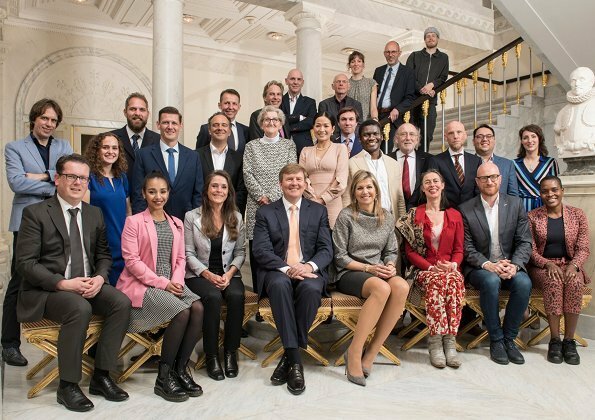 King Willem-Alexander and Queen Maxima held a lunch for 26 guests who have successful performances in various fields at Hague Noordeinde Palace on April 11, 2018, Wednesday. The guests consisted of award winner people having extraordinary performances in various fields like art, culture, journalism, science and sports. maxima is mooi hier. Ik vraag me af hoe die prinsessen zo gemakkelijk met die hoge hakken kunnen lopen. Greasy hair, grown out extensions and split ends....:-(( Wow! My very normal hairdresser who takes very normal prices would love to take care of this. I don't know any fifteen year old who would walk around like this, but the queen od the Netherlands does. Strange world! The rest of the outfit is okay but not really good. Maxima must start to think of how her knees look like when sitting. Any woman heading fifty must do so. That's nothing special to talk about, it is just time that goes by. Think about it. I think Queen Maxima has beautiful legs and knees. Absolutely nothing wrong with them. @Anonymous, of course Maxima has beautiful legs and beautiful knees and still I think it is fashionswise - think of proportions and think of photo angles when photographed in front - not the best choice to have a skirt end on mid thighs. I am in my mid fifties and still have beautiful slim legs, but when I wear a miniskirt only with black stockings. Look at the photo how much 'flesh' the queen is exposing. Nobody else does that. And there seem to be some beautiful, smart and fashionable women there. Her outfit, skirt and top is good for standing, but not the best choice for sitting in front row. I don't mean I like Maxima's hair, however I am not sure all the criticism I read really apply. Hair styling can take very different forms, including various thinning techniques. 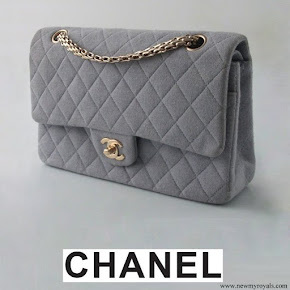 Fashion requirements involve more or less any features which could satisfy customers, sometimes far away from harmony crieria. 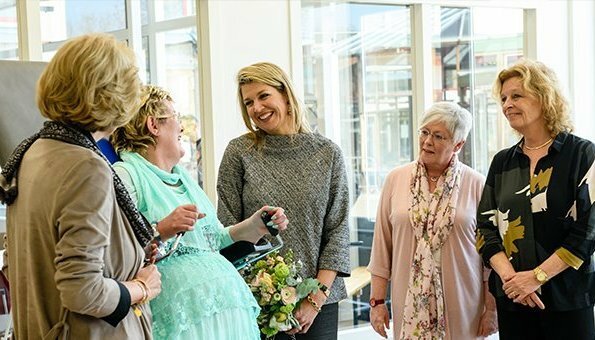 @Anonymous, I agree, hairstyles in 2018 may be very individual and natural, thank god, nobody wants Maxima to wear a helmet like her mother in law or like Mathilde of Belgium. The hairstyles after 2000/2010 are much more natural than in the decades before. Look at Letizia, she also has fine, sleek hair, but it is healthy, shiny, cut in the ends, it is styled although it looks 'unstyled. Most of us love Maxima for her personality and her work ehtics. What we critisize, or some of us, as this is a fashion bog, is the lack of her haircare and hairstyling. If this is a fashion blog then why talk about her knees? They're fine and look good. You're not Maxima so who cares you wear black tights. 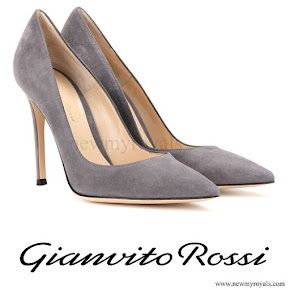 She is a strong woman who wears what she wants, how she wants. That is something to admire not bash. Her skirt isn't a miniskirt, clearly goes to her knees, even when she's sitting it's not mid thigh. Yes Beth, I agree with you, look how stunning and neat Laurentien, and Mathilde looks with their short hair. And Gilberte, I agree with you to, my feet ache for all these royal ladies in their high heels, sometimes walking on slippery floors, or while they're very far pregnant, day in day out, remember Kate, holding George as a baby, climbing down aeroplane steps in high heels. How do they handle it?? She looks good - except for the hair. Perhaps if it was cut a uniform length it would be better. It's the stringiness that is so unattractive.